Guest Post: What’s The Link Between Efficient Swimming & Efficient Solar Car Design? Our daughter Katie’s journey into the world of sports began as a small, skinny 4 year old. We first hit the soccer field with a general feeling of anxiety, not having any idea what to expect. Well, this journey was short lived, as Katie had more interest watching everything except the ball! Next up: Softball. Let’s just say that the dandelions got more attention… In her defense, she got hit in the face with the ball within the first 5 minutes, from a hard-throwing young rising star. She did stick it out for a few seasons, but in the end, so much for ball sports. As a kid, I was much like my daughter– not real great at ball sports, but I had always taken well to the water. So in looking for sports that didn’t involve a ball, we were naturally drawn to swimming. Why not “like father, like daughter?” At first, we just wanted her to learn to swim– as everyone should. Learning to swim didn’t come without its own challenges: either the water was too cold or she was afraid to put her head under. To our relief, however, something finally clicked, and after a few lessons, she started to take to the water like a fish. Of course, we needed to run with this new-found skill set and get her involved with other kids with similar interests– so we entered the world of competitive swimming! Summer rec league, to start… and what a start! Right out of the gate, first race, she won her heat, and that was all it took– you could see she was filled with pride! As we became more involved with swimming, it became apparent to us that proper technique would be critical as Katie progressed further into the sport. There is really no reason to commit hundreds– or thousands– of hours of training your mind and muscles to work a certain way, only to find out later that your form is inefficient. It would be much harder to correct these stroke inefficiencies later on, so why not learn the right methods from the start? Enter the Total Immersion Swim Studio! So, just how did we get involved with the Total Immersion Swim Studio? At about the same time Katie was getting into swimming, I was fully involved as the faculty advisor for our university’s international solar car program and racing team. Just like with Katie and swimming, we were late to the game and had to play catch up. A lot of the technologies could be bought – solar array, electric motor, electronics, and batteries; but what made the real difference is how you handled the inefficiencies. Every little loss of efficiency mattered – aerodynamic drag, rolling resistance, weight and balance. Being an engineer who uses research as one of the most valuable tools, I hit the books and quickly found an e-book by Terry Laughlin: “Swim Ultra-efficient Freestyle! The Fishlike Techniques From Total Immersion.” [Kindle version HERE] I became immersed in the book and couldn’t put it down. Everything made total sense to me, as the approach taken to learning to swim efficiently was very similar to the design of an efficient solar car! 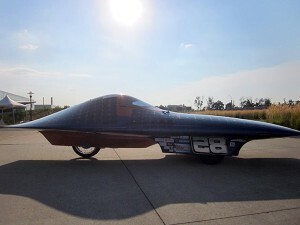 One thing that stood out was the importance of your body’s hydrodynamics in the water and how it relates to nature – exactly the same approach to the aerodynamic design of the solar car’s body. The whole idea of efficiency and how it relates to swimming was well thought out and addressed in Terry’s book. But the best was yet to come! When I first picked up the book, I didn’t realize that the Total Immersion Swim Studio (TISS) was located less than ten miles from where we live. People travel from all over the world to be trained here– what a find! So we reached out to the TISS and set up a meeting. We were greeted at the door by “Miss Alice,” Terry’s wife, and felt an immediate connection. Her enthusiasm was infectious and we couldn’t wait to get started! Miss Alice taught Katie early on how important it was to be an efficient swimmer. She introduced the same techniques that were taught to the adults in T.I. instruction, but at a level that Katie could understand– some teaching drills which stood out were: “Shark fin / Swordfish” [Skating/Switch drills] for her freestyle, and “Show me your shoulders” [emphasizing core rotation] for backstroke. After a few successful years of summer rec swimming, Katie asked to join our local year round competitive age group swim team, and about that same time she was introduced to “Miss Betsy,” Alice and Terry’s youngest daughter. They had immediate chemistry as “coach to student” and “friend to friend” – which they still enjoy to this day! Katie is currently working on stroke refinement techniques and hopes to one day swim competitively in college and maybe help out at the Swim Studio! She has found something that she is successful at, which makes her proud! She has had great coaches along the way– summer rec, year-round age group, and at the Total Immersion Swim Studio! She, and we, have made many great friends! She has become a very elegant and efficient swimmer, able to effortlessly swim more than a mile, non-stop, when she was just 10 years old. At the pool you can always spot the swimmers that have had TI training. More than anything, we just love to watch her swim! 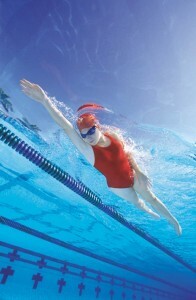 The Total Immersion Swim Studio has improved my swimming by an incredible amount. I remember when I first started swimming competitively on a summer recreation team when I was an 8 year old– I was pretty new to swimming, so I had terrible technique. My dad noticed that I was really interested in swimming, so he decided to research it more. He eventually stumbled across a book written by Terry Laughlin and was intrigued. He bought the book, looked over some of the technique tips, and decided that we should start going to Total Immersion. The coaches– Alice and Betsy Laughlin–were so nice to me and showed me lots of new ways to improve my swimming. By the next year on the summer rec team, I had already improved so much because of what Total Immersion had taught me, so my parents decided to sign me up for a year-round swimming club. During my experiences at Total Immersion, I learned so much about stroke technique and muscle memory and I would definitely recommend going to TI since I’ve greatly benefited from my time there. Katie Otis, a longtime swim student at the Total Immersion Swim Studio in New Paltz, NY, is a 7th grader whose favorite subjects are math and reading. Her favorite sport is swimming and her favorite stroke is butterfly. Her favorite pastime when not in school or swimming is hanging out with friends. Katie’s father, Mike Otis, is an engineering professor at SUNY New Paltz and swim dad, and his favorite pastime when not working or at the pool is traveling with the family and enjoying outdoor sports. Katie’s mother, Lisa Otis, is a 4th grade special ed teacher and her favorite pastime when not working or at the pool is doing fun things with the family.